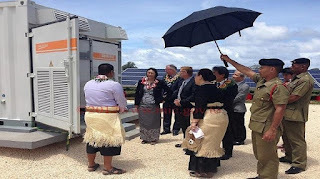 The “Matatoa Solar Farm – Tonga’s Largest Solar Facility” commissioning ceremony was held yesterday at Tofoa. Officiated by His Majesty, King Tupou VI, the commissioning marked a new milestone in private sector investment in the development of renewable energy generation in Tonga. The project is the first large scale Independent Power Producer facility to be installed in the Kingdom. Occupying 6.3 acres of land and comprising of 7440 panels, the Matatoa Solar Farm, built and operated by Zhuhai Singyes Green Building Technology Co. Ltd, is expected to generate over 2,828,84 kWh of electricity over the first year of operation which is the equivalent of 680, 000 litres of diesel savings for the first year of operation. The USD$4.4 million project or the equivalent of $9 million pa’anga, is the largest Independent Power Producer investment in Tonga created 20 local jobs during construction. Carl Sanft, the Chairman of the Combined Utility Board said, “To date 12% of the renewable energy target for Tonga has been achieved”. “The project, permitted by Zhuhai Singyes Green Building Technology, is selling all the electricity generated from the plant to Tonga Power Ltd to assist the Government with the 50% renewable target by 2020 at TOP 0.33 per kWh which will remain the same for the next 25 years”, said the Chairman of the Utility Board Mr. Carl Sanft. “In order for TPL to help the Government achieve 50% renewable energy generation by 2020, grant financed investments of between US$32-$35 million is needed to help generate an additional 43% in renewable energy penetration through investments in solar, wind farms, as well as installation of much needed battery storage. This means that we can reduce the power tariff by 20 to 30 seniti per kWh”,” he added. “The Government of China and Tonga Power Ltd have also commenced a dialogue, for the installation of a 2 Megawatt wind power generation project in Tonga and the Government of Japan had granted funding for a 1.3 MW wind generation project”. In September 2016, Tonga Power Ltd signed a 25-year Power Purchase Agreement with Zhuhai Singyes Green Building Technology Company Ltd.
“By engaging an Independent Power Producer like Zhuhai Singyes, it contributes to the energy sector achieving its goals by utilizing third party investments in clean electricity generation”, said Tonga Power’s CEO, Robert Matthews. In his address to the gathering, His Excellency Mr. Wang Baodong congratulated the effort by Tonga Power Ltd and the Government of Tonga. “It is good to see the interest that the people of China have invested in Tonga in the energy sector and we look forward to more Renewable Energy in the future”. The Chairman of the Utility Board, Mr Carl Sanft, acknowledged the support from the development partners such as the Government of Australia, China and Japan as well as the European Union and the Asian Development Bank, Zhuhai Singyes Green Building Technology Co. Ltd and private investors for their support towards Tonga’s Renewable Energy Target. Honourable Poasi Tei acknowledged Sam Leung, the Deputy CEO of Zhuhai Singyes Green Building Technology, CCECC, JH Electrical, T.E.A.M Power, SPS, Kramer, Ausenco and AECOM New Zealand Ltd for their contributions towards building a more resilient and prosperous Tonga. The ceremony was also attended by the Ministers of the Crown, Ambassadors, church leaders, overseas visitors and distinguished guests.